Rhubarb is my new best friend, but it has not always been this way. I've got a wonderful memory of a particularly delicious strawberry rhubarb pie from my childhood, but beyond that my relationship with this lustrous red-stemmed plant (although many varieties aren't super red) was greatly lacking... until this season. It started in Ireland. My host and I had the fortune of picking up some fresh rhubarb from her sister's garden. She then simply cooked it in some sugar and water and that was that. 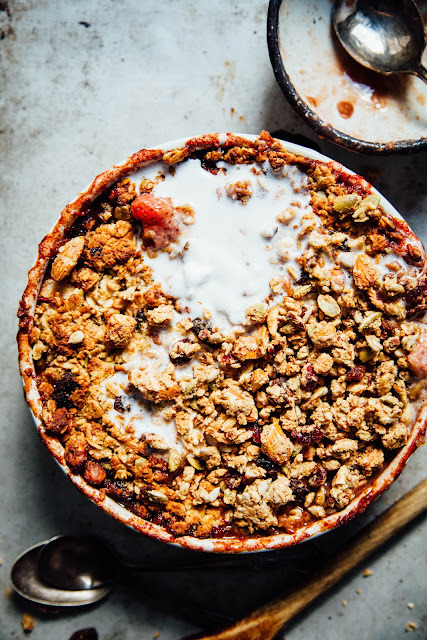 I ate it with almond yogurt, cinnamon and rolled oats for breakfast and I was blown away. I had forgotten how incredible rhubarb is: the tartness, the freshness, the sweetness, the colour! Following that, once I was home, a friend made me a wonderful raw dessert plate involving a crepe, cashew cream, and vanilla-marinated rhubarb, among other things. Once again: taste buds were blown away. Since then, I have had rhubarb on my mind and my mind on rhubarb. 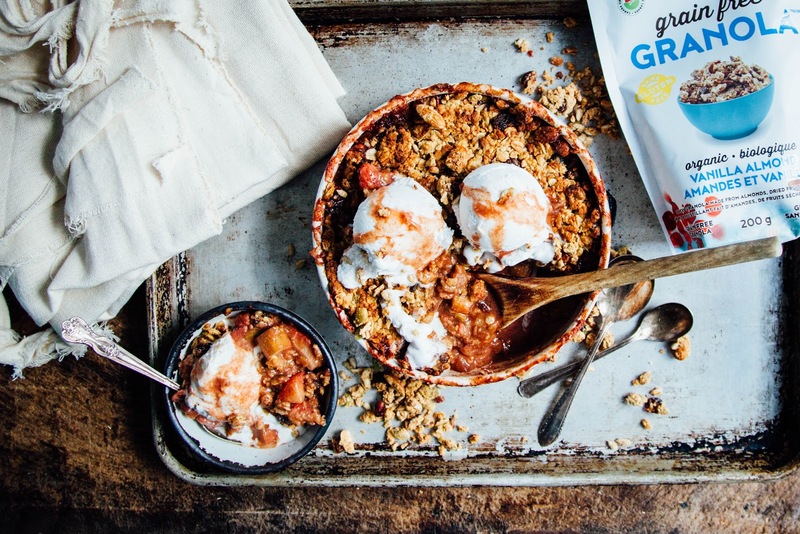 So when a friend at Hippie Snacks asked if I'd like to work with them on a recipe involving their organic granolas, my mind immediately went to some kind of rhubarb and fruit crumble or crisp. We have a rhubarb bush in the yard but to my dismay, I discovered a couple days ago that it is 1) not ready to be harvested and 2) there isn't enough to harvest anyways. Sad face. So I picked some up at the grocery store and used that along with some strawberries to make the recipe before your eyes. And as I write this post, I JUST went to the farmers market and bought another bunch of rhubarb there. I am so excited to experiment with it in more recipes and share my creations with you! Regarding this recipe: wow. 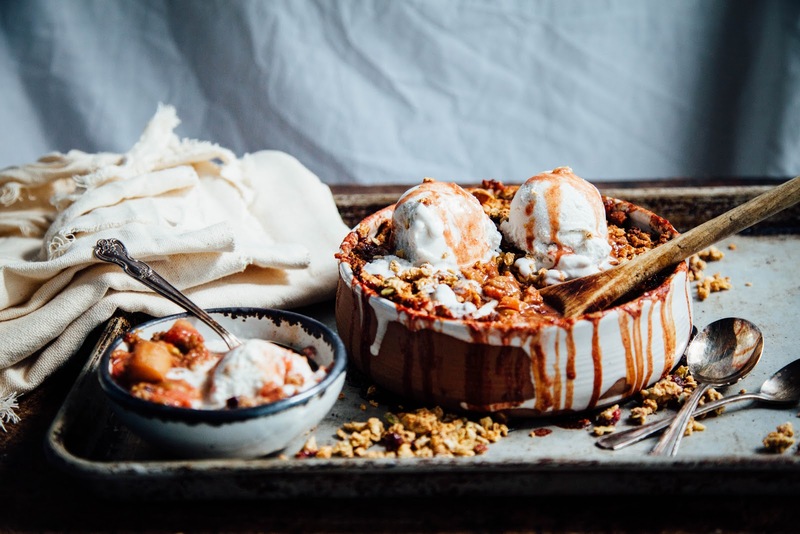 Since I had basically never cooked with rhubarb before this, I wasn't sure if it would turn out. But frankly, I think it's perfect. It's juicy, tart with a hint of sweetness (from coconut sugar, orange juice and maple syrup), cinnamon-y but not overwhelmingly so, fresh and in tune with the seasons. The topping is a mix of chewy and soft oats with crunchy Vanilla Almond Granola from Hippie Snacks. I could eat the entire thing myself. 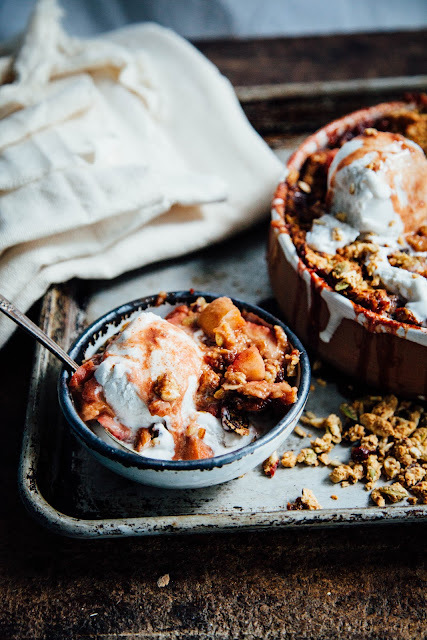 It is definitely best fresh out the oven paired with a fat scoop of vanilla coconut ice cream and an extra sprinkle of granola. 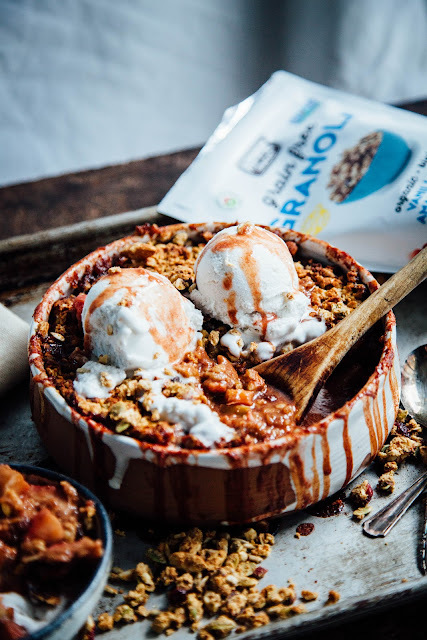 I adore the granolas from Hippie Snacks because they are made entirely with ingredients I would use at home: nuts, seeds, dried fruits and wholesome sweeteners and flavourings. The Vanilla Almond is my fave, but they also have two other varieties: Seeds & Fruit, and Maple Quinoa. Hippie Snacks' Coconut Clusters are, incidentally, highly habit-forming. The Sesame variety is literally impossible to stop eating, but it's chill because they're basically just dried coconut meat with a bit of coconut sugar and sesame seeds. Finally: I love Hippie Snacks because they are VERY local (their HQ is less than 30 minutes away from my house). This post is sponsored by Hippie Snacks cuz I got bills to pay, but as always, all opinions are my own. I am a big fan of this company, their ethos and products. I am also a big fan of this rhubarb crumble. To make the filling: toss all the ingredients together until the rhubarb and strawberries are evenly coated. Scoop into a baking pan or ceramic dish (note that it will cook down so you can over-fill a little here). To make the topping: toss all the ingredients together until evenly mixed. It should be moist enough that parts are clumping together and if you press it together it mostly holds its shape. If it's too crumbly, add more orange juice. If it's too moist, add more granola. Press firmly and evenly on top of your filling. Put a pan on the bottom rack of your oven and your crumble on the rack above this. It will get bubbly and might bubble over the sides of the dish so you want a pan to catch the juices. 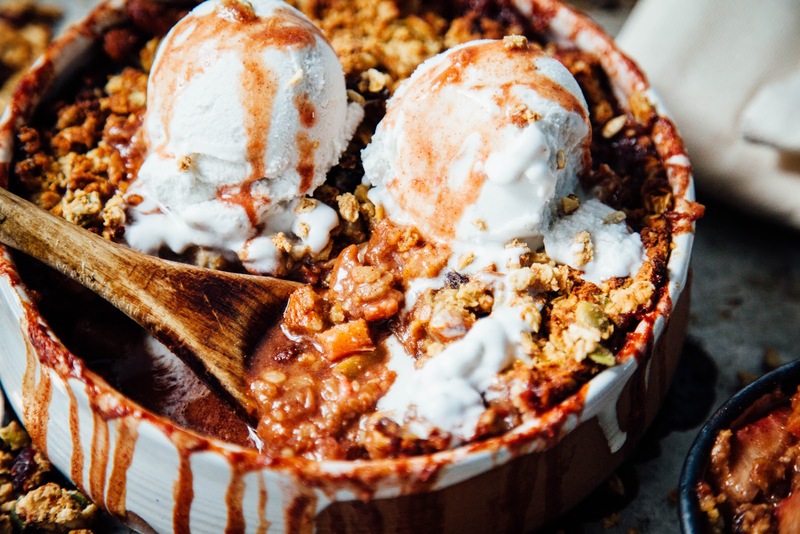 Bake your crumble at 350 for 30-40 minutes, or until the topping is golden brown and the filling is bubbling over. If it's still quite juicy and you don't want that, cover the top with tinfoil and bake for an additional 15 minutes at 375. 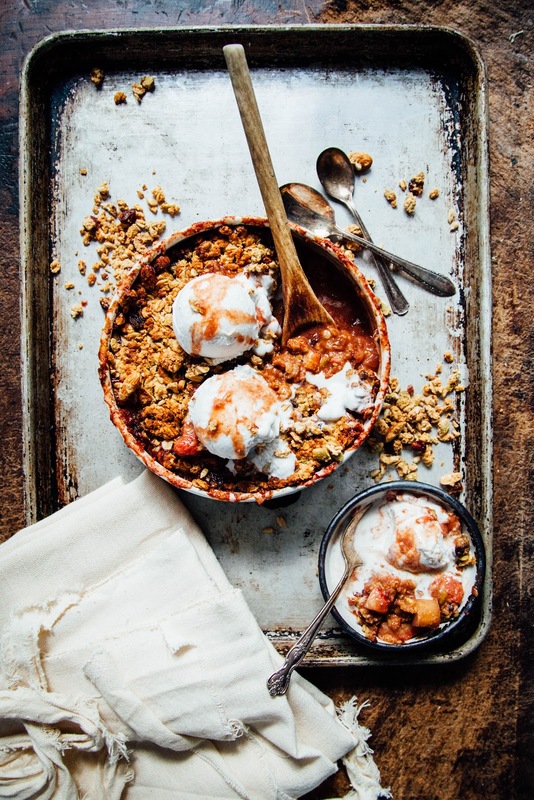 Highly recommended: serve hot with vanilla coconut ice cream and extra granola!